I've been really excited to see the new Jurassic World film. I was a bigger fan than most of the first one. I thought it was a perfect realization of what a real, Disney World-esque, dinosaur park would look like. 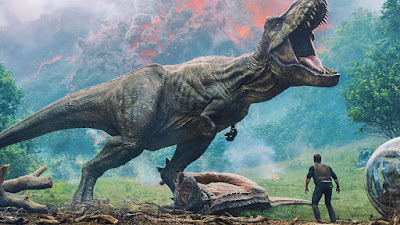 Colin Trevorrow did a fantastic job blending that elements with the thrills of the original film, making a really great return to the franchise. However, I wasn't big on the first trailer for Jurassic World: Fallen Kingdom. I thought it was kind of lacking, and the plot they displayed seemed rather minimalist by nature. For the fifth entry into this series, we really need something different. Something other than just people running away from dinosaurs, and that first trailer didn't seem to offer up anything new. You can watch that trailer here. But with A Monster Calls director J.A. Bayona behind this installment, I was sure the finished film would offer up something unique. And during the Super Bowl today, a new trailer for Jurassic World: Fallen Kingdom dropped. I liked this trailer a lot more than the first one. It captures a lot more of the horror of the scenario, something Steven Spielberg did a great job with in the original Jurassic Park, but was lacking from Jurassic World. These movies should be fun and exciting blockbusters, yes, but there is also a horror quality that must be present. Essentially, these are disaster movies, and they should feel like such. Just when I thought the trailer was getting a little too heavy on the horror, it came back with a lot of the fun and excitement from the first movie, and left me feeling like this film will be a great time at the movies. However, I rolled my eyes once it got to the end. They genetically engineered another hybrid dinosaur? Really? That's exactly what they did in Jurassic World. Maybe that's not what actually happens in the movie, and the clip shown was out of context. But from what we see on screen to what we hear from the little girl, it makes it sound like they're going right back to what they did with the last one. That disappoints me. It's kind of like the reoccurring Death Star in Star Wars; we don't need another hybrid dinosaur. Hopefully that's not actually the case, and it's different once we see the movie. But overall, I liked this trailer a lot more than the last one. I'm happy with a lot of what they showed us, and this sequel seems like it has a lot of promise. What do you think? Did you like the new trailer for Jurassic World: Fallen Kingdom? Are you looking forward to seeing the film? Leave your thoughts in the comments section below.